Despite the Smashing Pumpkins' "reunion" still being very much up in the air, Billy Corgan is keeping the rumour mill humming by stating he's working with production hero Rick Rubin in the studio. While very much unconfirmed, many are taking the news to mean Corgan is working with Rubin on the Smashing Pumpkins' so-called "reunion album." 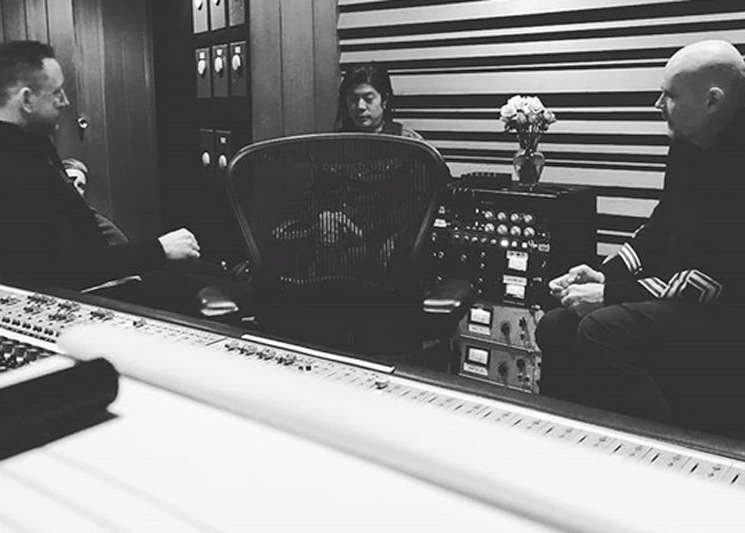 In a recent Instagram post, Corgan wrote, "We are currently in the studio with Rick Rubin. But unless I show you a picture of Rick sitting Buddha-like at a mixing desk, you probably wouldn't know that." However, that "we" isn't clarified in the slightest, though fans have been quick to say Corgan means with the Smashing Pumpkins. This comes based on the fact that Corgan had recently posted studio photos of himself with OG Pumpkins members James Iha and Jimmy Chamberlin (see above), though noticeably not with bassist D'Arcy Wretzky (whose status in the group is currently a huge ball of confusion). For now, you can see Corgan's rumour-sparking post for yourself below and draw your own conclusions. The post itself came as response to a recent yet undisclosed health scare experienced by Corgan. Corgan worked with Rubin on last year's Ogilala solo album. Albert Hammond Sr. Says the Strokes Are Working with "a Great Producer Called Rick Rubin"
Beefs 2011: Slipknot's Corey Taylor Calls Rick Rubin "Overrated and Overpaid"